What’s really playing out here is a debate around agency. Who’s in control when you’re inside Facebook – are we, or is Facebook? Most of us feel like we’re in control – Facebook does what we tell it to do, after all, and we seem to like it there just fine, to judge by our collective behaviors. Then again, we also know that what we are seeing, and being encouraged to interact with, is driven by a black box, and many of us are increasingly uneasy with that idea. 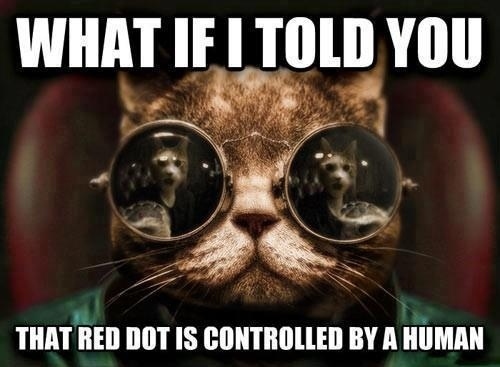 It feels a bit like the Matrix – we look for that cat to reappear, hoping for some insight into how and whether the system is manipulating us. Weather is a powerful concept in relation to agency – no one controls the weather, it simply *is*. It has its own agency (unless, of course, you believe in a supreme agent called God, which for these intents and purposes we can call Weather as well.) It’s not driven by a human-controlled agency, it’s subject to extreme interpretation, and it has a serendipity which allows us to concede our own agency in the face of its overwhelming truth. Facebook also has its own agency – but that agency is driven by algorithms controlled by humans. As a model for the kind of world we might someday fully inhabit, it’s rather unsettling. As the piece points out, “It is impossible to discover something in its feeds that isn’t algorithmically tailored to your eyeball.” Serendipity is an illusion, goes the argument. Hence, the “I changed my habits on Facebook, and this is what happened” meme is bouncing around the web at the moment. The Motherboard article also bemoans Twitter’s evolution toward an algorithmically-driven feed – “even Twitter, that last bastion of personal choice, has begun experimenting with injecting users’ feeds with “popular” content.” Close readers of this site will recall I actually encouraged Twitter to do this here: It’s Time For Twitter To Filter Our Feeds. But How?. The key is that question – But How? To me, the answer lies with agency. I’m fine with a service filtering my feeds, but I want agency over how, when, and why they do so. I think that’s why I’ve been such an advocate for what many call “the open web.” The Internet before Facebook and mobile apps felt like a collective, messy ecosystem capable of creating its own weather, it was out of control and unpredictable, yet one could understand it well enough to both give and receive value. We could build our own houses, venture out in our own vehicles, create cities and commerce and culture. If anything was the weather, it was Google, but even Google didn’t force the pasteurized sensibility one finds on services like Facebook. As we like to say: Pray for rain. Next Next post: Else 9.2.14: Don’t Worry, The Robots Are Our Friends. But the People?